I remember Linda very well because her fiance and her came from Medan, Indonesia. 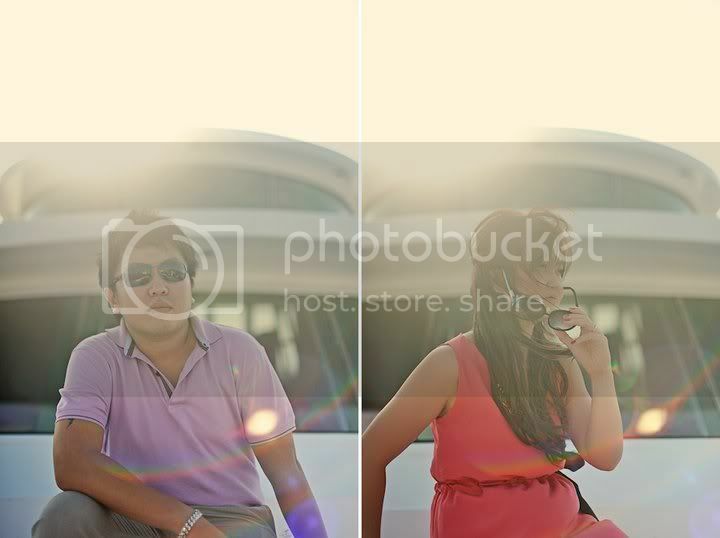 They arranged for their pre-wedding shoot in Singapore and I am very lucky to have the chance to work with them. She had very clear ideas of what she liked and the themes she had in mind. 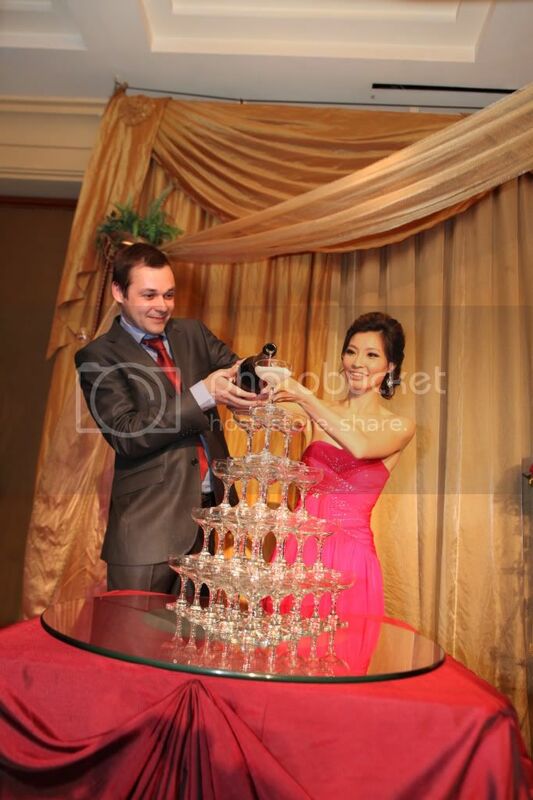 I was totally blown away with the pictures which along with their well-planned themes looked fantastic. 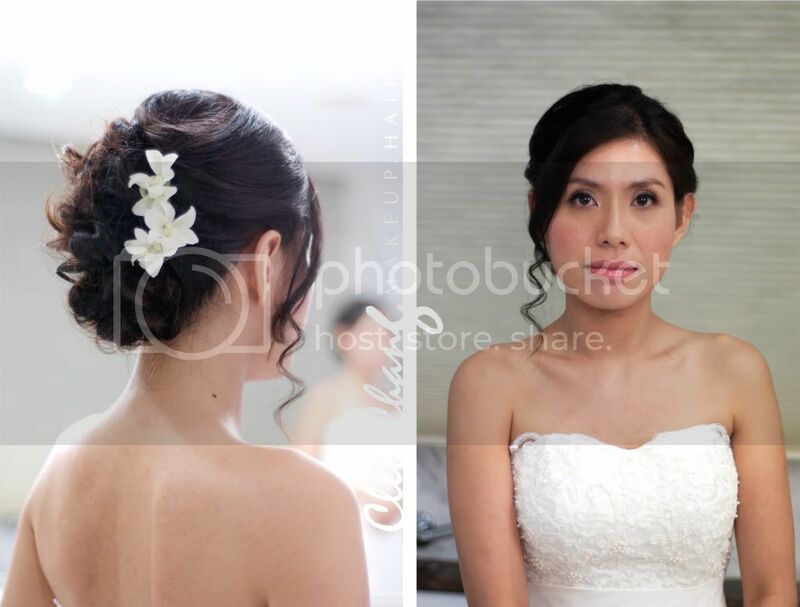 Linda had an Audrey Hepburn inspired hairdo for her beautiful wedding gown. This is one of the prettiest wedding gown I have laid my eyes on. Absolutely stunning. 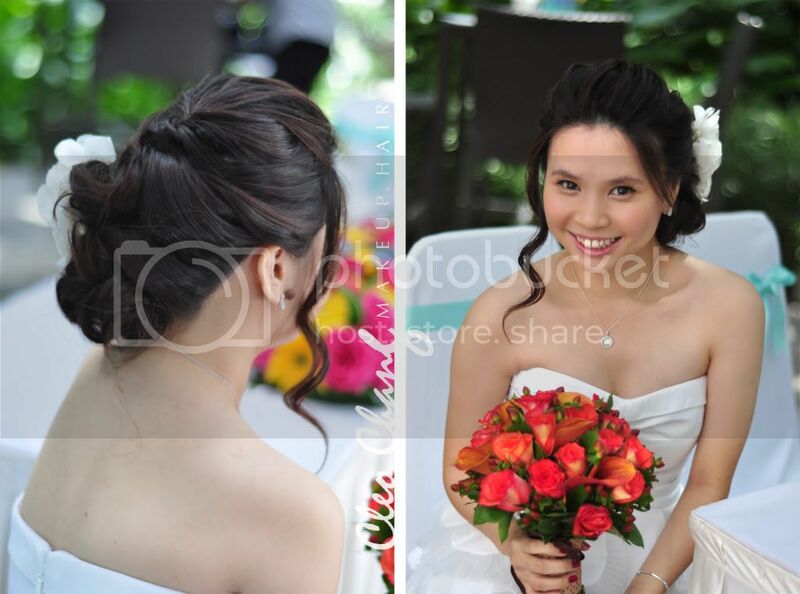 Linda looks very queen-like in her wedding gown and hairdo. A side chignon for her fusion pink toga gown and a let down hairdo for her causal shoot. It is worth mentioning that her hairstyles are creations of a mixed of her real hair and hair extensions as Linda has shoulder length hair. I do not usually use hair extensions but I think the effect was really nice. I might consider using hair extensions more often from now. Photography by Juvenco Pelupessy from in.Capture Images, Indonesia. The rest of the pictures can be viewed at his port. I love how he captured the candid moments. 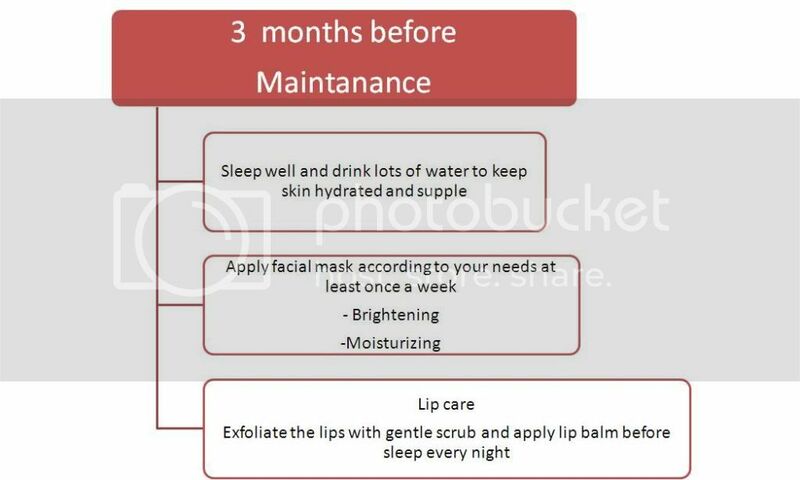 Brides from Indonesia, if you are planning a trip to Singapore do get Juvenco! Last and not least, thank you Linda and Beny for the experience and the breakfast. I am starting to love Pocari Sweat. My Indonesian colleague immediately could tell you guys are from Indonesia when she saw me carrying my breakfast into the office. She said Indonesians love that drink. I just saw some of the pictures Cozycot uploaded on their Facebook so I grabbed them and thought I should share with you as it had been a long time since I last rambled nonsense on my blog. 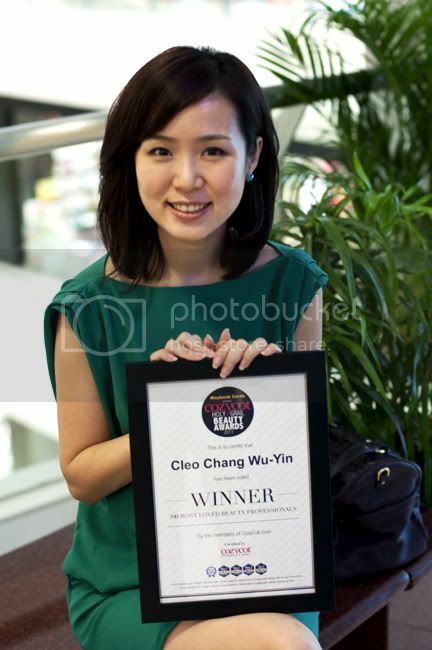 Always a cool-lonely-daredevil, I strutted my way (without my trusty luggage) to the award ceremony held at Orchard Central alone in my lovely pink heels. Flustered in the crowd, I wasn’t given a chance to cool down before a young boy approached me with a mike and asked “Hi, we would like to interview you on your thoughts about makeup and fashion.” Let’s just say I was a horrible interviewee and I wondered where did all the critical thinking I had learnt in NUS disappear to. It was like hearing my own mouth fell down the stairs. Gathering the rest of whatever self esteem I had left, I sat quietly at the VIP area waiting for the ceremony to start. Two thoughts kept going through my head. 2. Cleo, your mouth went bonkers but at least you color blocked. People, please notice I was wearing a lovely green dress with pink heels. Maybe people will think you are just a flat bimbo. Anyway, I enjoyed the ceremony coz I was gorging my eyes out at the founder of Cozycot. She is very pretty and elegant. I think a lot of people can be pretty. Features can always be enhanced but elegance, the air around a lady, that is the part that could not be faked. I admire her entrepreneur spirit and her beauty. All the more I cannot trip. 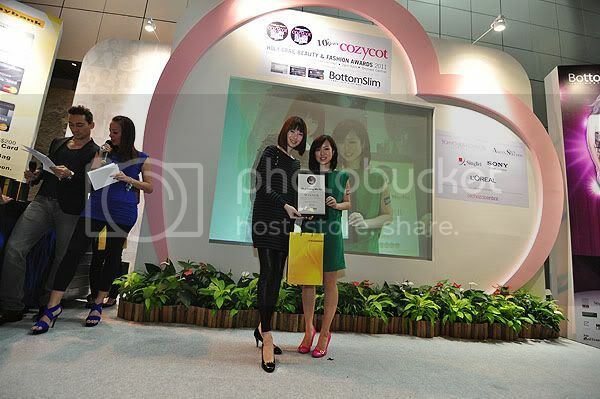 Thank you Cozycot for the award for 100 most loved beauty professionals. This gave a me chance to meet the rest of the people in the Beauty industry. I am pretty sure there are many other beauty professionals who are great in their craft (like my hairdresser, oh ya, noticed my short hair? I loved it), I am just lucky to be chosen. I will treasure this award and moment but actually what I valued most will still be the appreciations from my brides. That beats all awards. Kane for her actual evening. She wanted something that is more romantic and soft so I gave her a slightly messy updo. The essence of this hairdo was her fringe and the loose curls framing her face for the touch of softness to her features (Ok, I admit, I love the back of the hairdo too). I had Kane to trim a little of her hair prior to her wedding day in order to achieve this effect and I would say this looked stunning on her. Her makeup is kept natural with a little eyeliner and faux eyelashes to bring out her eyes. Love this romantic look and with the fantastic lightnings, I captured Kane beautifully, I would say. I always think it must be fate that brings two person of the names starting with the same capital together. Really, what are the chances? Very fortunate to know this great couple and I am always charmed by Esther’s hospitality and her smile. When she laughs showing off her cute dimples, I can’t help but laughed along. 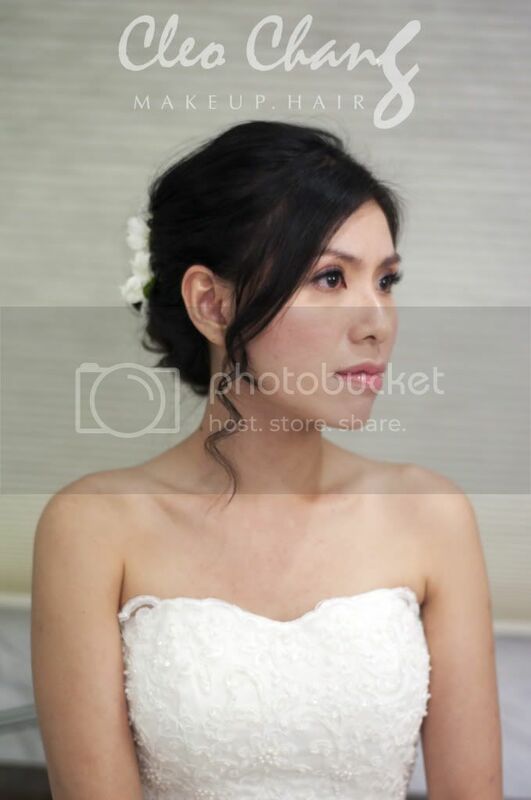 Esther is very tall and slim and she had chosen 2 jewel neckline gowns for her wedding night. Before her 1st march in, Esther chose to put on a very red lipstick color coz she has always wanted to try. For the 1st march in in her purple cheongsam we changed the lipstick to a peachy color for a natural look. Eyes were played up a little for the evening look. For her second march in, we wanted to create a more stylish and clean look so we had her fringe all up and hair all up into a twirled bun to show off her neckline. Very elegant. Thank you Esther for the lovely pictures and your invitation to your dinner. It was a lovely experience. For the evening, Cheng Teng had me for 2 looks. 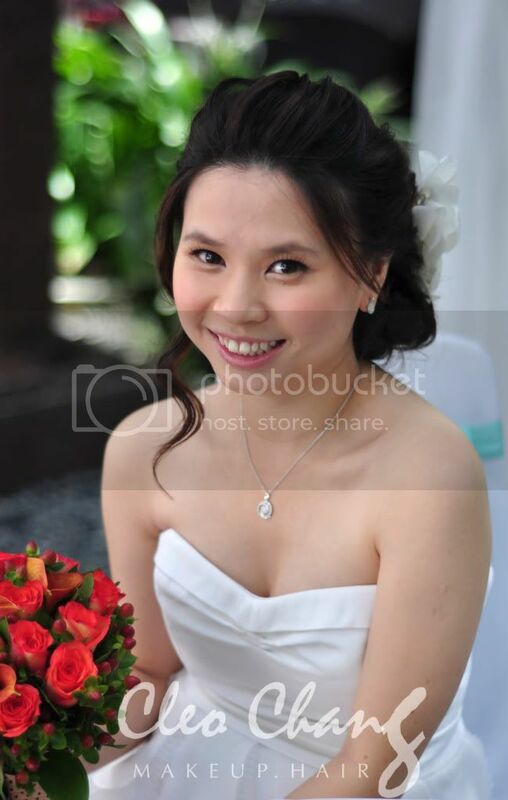 The 1st march in was still in her bridal gown so I gave a goddess look to complement her flowing white gown. Her hair was twisted into a let down hairdo finished with a ribbon hairpin just to add abit of sparkle to the hair. Eye makeup was a little darker for the evening while the lips and cheeks are left in a natural blush. 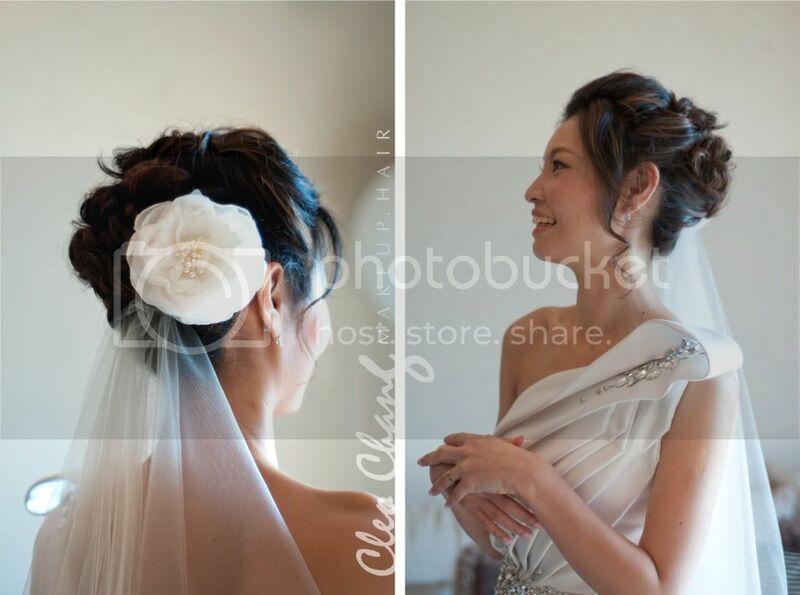 I could say Cheng Teng gave me 100% freedom create her bridal look. She sent me a few pictures of Korean actresses and during the hair trial she just let me do whatever I think is suitable. I would think I did not disappoint her. Makeup was set to be radiant and natural. 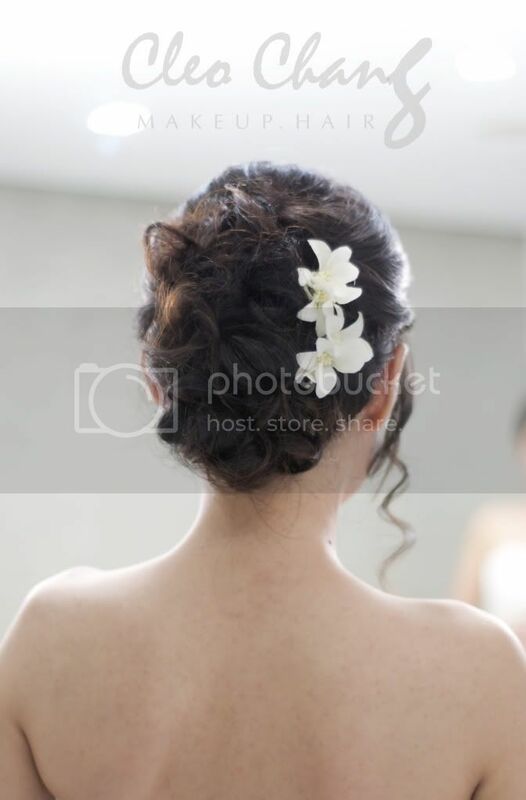 Her hair was twisted and kept at medium height for a more youthful look. Fringe was combed up for a fresh look and a few hair was kept loose for a more romantic feel. Finished off with a white bloom, I think Cheng Teng looked divine. 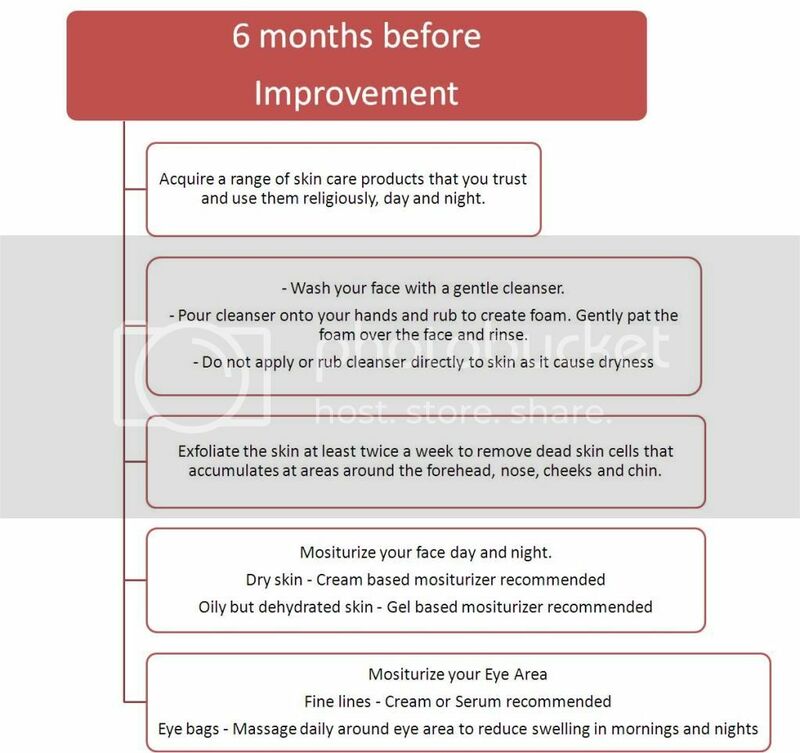 I always have brides asking what they should do for their skin. However by the time they asked, we do not have much time left to find a remedy. 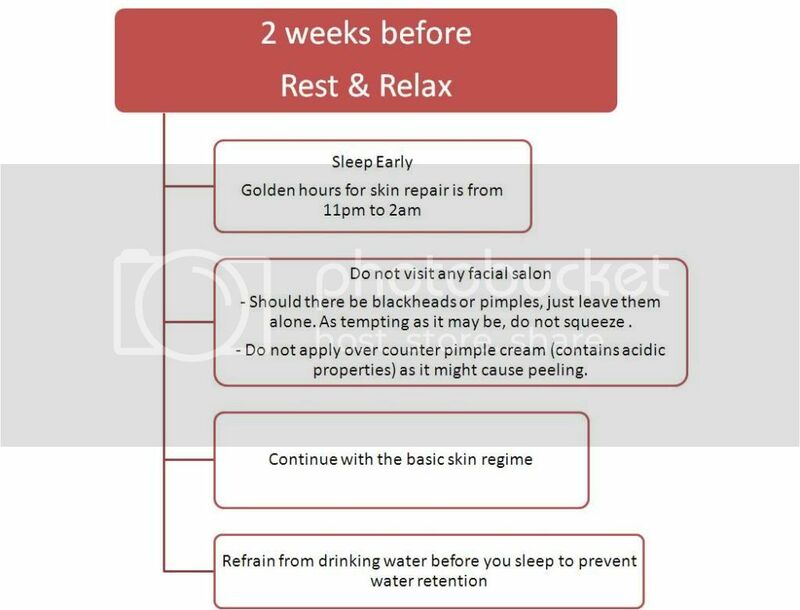 Hence, I came up with this flow chart, hope this could help brides to achieve their smooth radiant skin before the big day. For the those who like to print out, do click here for the whole chart. 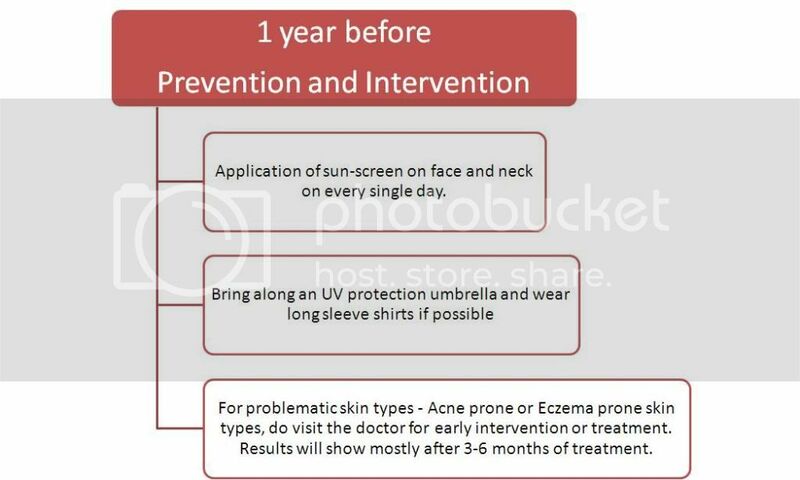 I will discuss in details of some individual topics like the purpose of suncreen, eye massage, etc in my up-coming posts. Well, I am brisking in the love. Do like my profile if you happen to be a satisfied customer of mine, a blood related member of mine, a very good friend of mine or you just want me to walk away with a mystery gift from CozyCot for being voted “Dearest Beauty Professional”. I promise I will share what I received here, if I received it. Alluring is it not? Click on the print screen to bring you to Cozycot’s profile of Cleo and “like” it !! As promised, more pictures of Rachel’s ROM. A beautiful setting and a beautiful bride. 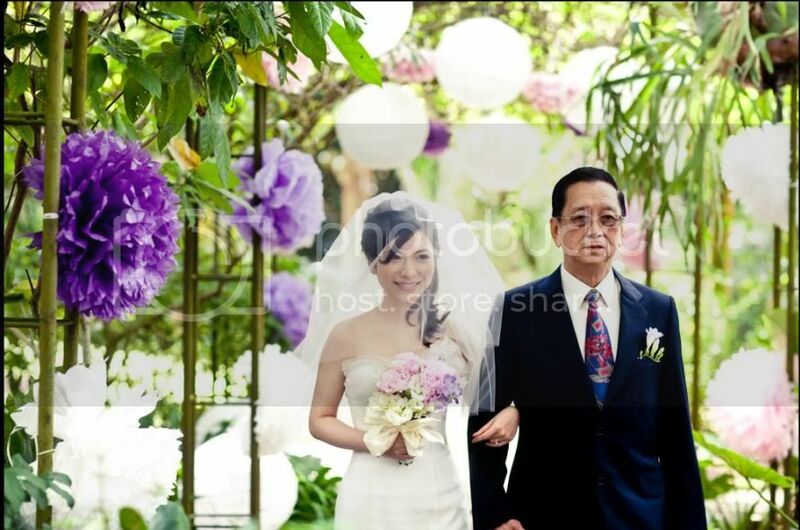 Rachel wanted something sweet and natural for her outdoor solemnization. 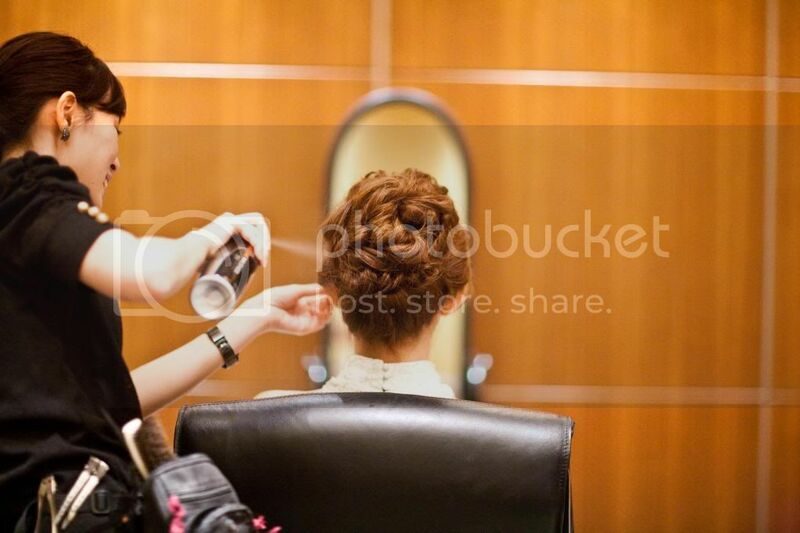 We decided on a side hairdo with large curls settings and natural radiant makeup. Rachel has very pretty almond shaped eyes which just require alittle emphasis and pretty natural eyelashes to complete the whole look.